Unfortunately there is probably not a single surface in your facility that doesn’t need special attention to keep it looking beautiful and clean. One surface that most people think is low maintenance is a stone floor. Many people think that because it is a permanent floor it does not need special care, but if the stone is abused and neglected then the natural beauty of the product disappears. Since dirt and dust cause the most damage to stone, dust mopping is extremely important. It is necessary to do this daily especially when it comes to removing abrasive agents from the stone floor. The second important part of stone floor maintenance is mopping. Half of the battle is finding the right tool for the job and the other half is finding the right cleaner. A good mop is one that has not been treated. It is also good to use one mop just for this job, since using other mops could bring along chemicals that could do damage to the floor. When it comes to picking a cleaner, you should use a neutral cleaner with a pH around 7, as other cleaners might leave a film. 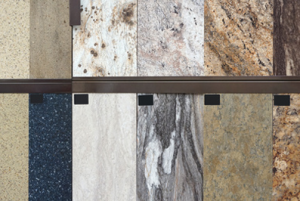 The exception to the rule is granite, because it is harder and can tolerate harsh chemicals. Natural stone tends to be more sensitive. Stone floors become dull and lose their shine over time and the most common culprit is a buildup of product in tiny scratches. With a daily floor care plan in place your floor will sparkle and gleam, posing a welcome to all who enter. Some stone floor safe & effective products are listed below. PreviousPrevious post:Stay Classy All Year RoundNextNext post:When Is a Sanitizer Not A Sanitizer?